Finally I have found some extra time to take photos (helps havin' an extra day off too!). My time spent has been well worth it: not only have I gotten lots of photos taken, up loaded, re-sized, and re-located; I also have them ready to go for blog posting throughout the month of March. Yep, I plan on doing a post a day with photos from my December Daily, to run from the 1st to the 31st. Not sure if there will be anything else along with those posts yet but then again you never know. 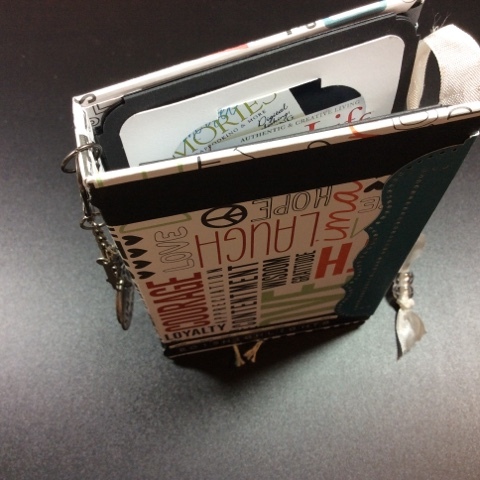 Through out the book you will notice that I have used the same patterned paper as my main page, it is a double sided paper which really works well for these types of projects. Then you might notice that I have a few transparencies and some tags thrown in to dub as pages also, I think this certainly gives the album some character. I have tried to keep the embellishments down on the lined patterned paper, as this is where I will be writing my thoughts; but as for the rest of the pages, I just let the album take on its own flow. If it felt right, I went with it. The binding I chose to do on the top, just my preference right now; that and I am enjoying playing with the 'bind-it-all' that I got last fall as a B-day gift from my mother-in-law. That's the cool thing about having your own binding tool, your pages can be whatever size &/or shape you want them to be, there is no right or wrong way to do it. I was excited to use some of my digital products as well on this album. The "HAPPY" bingo card is one that I've purchased recently; all I did was just print it out on brochure paper, then altered it a bit with walnut stain, I think I even wadded it up, then smoothed it back out again to give it some authenticity. On this page you'll notice the measuring tape that I've threaded through a ribbon slide, that is really a measuring tape. Every so often I pick up one of those little inexpensive tape things @ Hobby Lobby just for the sole purpose of cutting it up to use on a layout or in this instance, a mini album. They are great fun and add a little bit more 'umph' than just a paper replica. Well that's all I have for now, hope you enjoyed actually seeing something new. I have every intention of getting posts up every day through out the month of March, so we'll see if I can really make it happen, but even if not every day- hopefully more like a couple times a week. I'm going to try really hard!